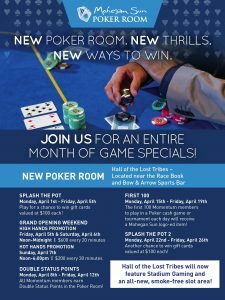 Come join us for an entire month of promotions this April as we celebrate our New Poker Room located in the Casino of the Earth. Shout out to Ricardo Silva for making the top of the list this week with a total of 290.00 points! Rumor has it Eric Hall was on vacation recently, leaving his opponents with a larger than usual lead. March & April may be the rise of a new points leader; luckily, this is just the friendly part of the competition! The top 150 players with the most points between March 1st & April 30th will be invited back to compete for the real prize on the last Tuesday evening of May 2019. Plenty of time for everyone to play for their chance for a seat in this (minimum) 10K Guarantee Player Appreciation Freeroll! Thank you to all of our regular, devoted players, on your patience with the relocation to the new Poker Room. If you haven’t heard, we are now located in the Hall of Lost Tribes in the Casino of the Earth. We are behind the Bow & Arrow Sports Lounge and adjacent to the Race Book! 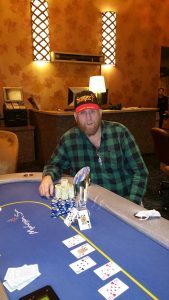 Our March Freeroll (Jan-Feb qualifying period) boasts a total prize pool of $16,710. The top 168 players will return to play on Tuesday, March 26, 2019 at 6:00pm. Registration closes promptly at 7:00pm. Listed (below) are the top 20 players of the Freeroll who will receive a starting stack of 20K in chips vs. 15K for the remaining 148 players. The top 20 will also receive a $10 daily food comp for April 2019. Congrats everyone! We look forward to seeing you in March! ALL-NEW POKER ROOM OPENING TOMORROW!!!!! We have a race to the finish for our Best of the Best January/February 2019 Qualifying period! There is one more day left to finish in the top 20 for a daily, $10 food comp for the month of March 2019. Best of luck to everyone, the finalist list will post within the next few days! 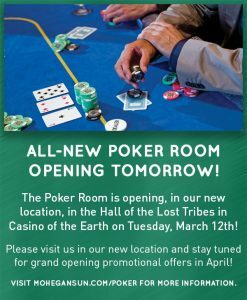 The Poker Room will begin moving effective Tuesday, February 26th to relocate in the Hall of Lost Tribes located in Casino of the Earth. While the move is taking place, poker tables will be available in the Casino of the Wind on a temporary basis. The new Poker Room will open in the middle of March. For continued updates on this exciting new move, please contact the Poker Room directly. Kenny Blair, with the trophy, January 29, 2019. 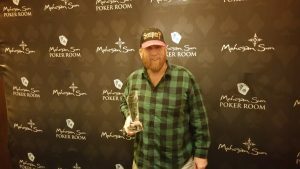 As of February 13, 2019 the Best of the Best prize pool for the January/February 2019 qualifying period totals just shy of $12,000! The top 150+ qualified players are scheduled to play on Tuesday, March 26, 2019 at 6:00pm. As a reminder, registration closes by 7:00pm (no exceptions). There is still time to make it in the top 150 in points, currently the 150th player has 55 points. Our Wednesday night tournament is the easiest way to qualify! Make the money and you receive double points (ex: 1st place points= 50 X 2+ 100 points). Each player receives 10 points for any entry or re-entry for the Wednesday night, 6:00pm Superstack! Double (2 x) Momentum Dollars & Double (2 x) Status Points! Friday, February 8th! 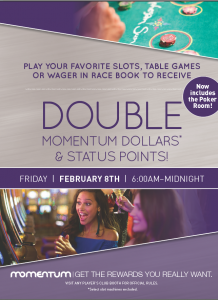 Momentum members will earn Double Status Points and Double Momentum Dollars while playing in the Poker Room (Excludes daily poker tournaments).